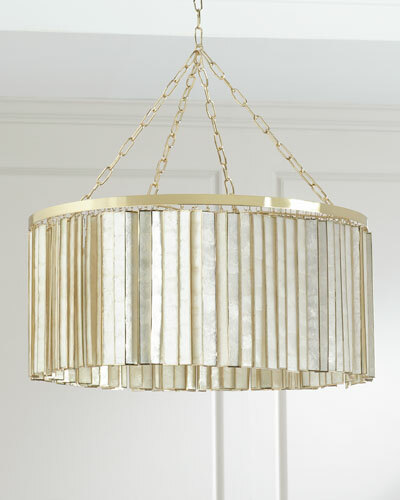 Brighten up your home with Neiman Marcus’ dazzling collection of chandeliers and pendants. We carry an exquisite selection of chandelier and crystal pendant lighting to add a warm glow to every corner of your home. Our crystal chandelier lamps are available in various styles, shapes, and colors, making it easy for you to choose the right light fixture. With innovative designs including leaves, flowers, butterflies, and more, our chandelier lighting blends beautifully with your home décor. Our stunning pendant chandeliers will add lovely visual flair to living rooms, kitchen islands, and banquet halls. 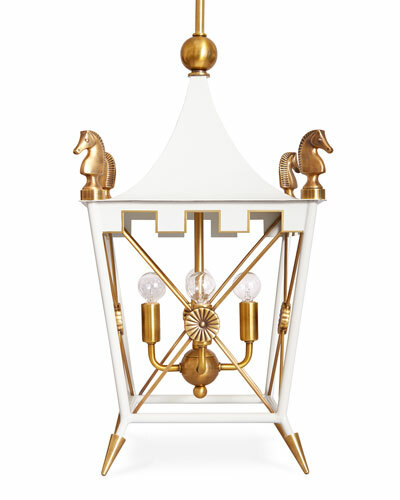 For chic lighting, you can opt for our mini chandeliers. To lend a vintage feel to your countryside home, go for our large chandeliers. 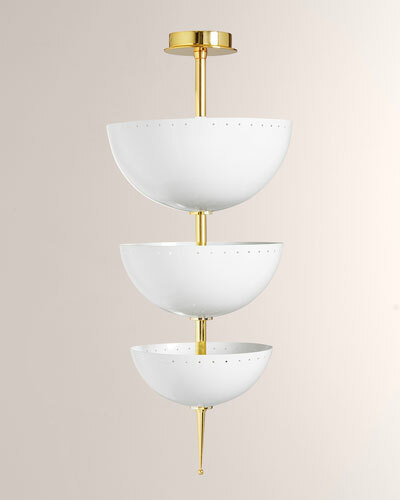 Designed tastefully with brass, silver, and antique gold finishes, our lamps give an opulent appeal to any setting. Shop Neiman Marcus for chandeliers and pendants, and create an elegant backdrop. EXCLUSIVELY AT NEIMAN MARCUS Eight-light transitional chandelier draped in clear cut oyster crystals. Uses eight 60-watt bulbs. Steel in antiqued gold finish. Professional installation required. Overall, 29"Dia. x 28"T. Back plate: 6"Dia. x 1.25"D. 6' chain; 10' wire. Imported. Weight, 13 lbs. Boxed weight, approximately 17 lbs. EXCLUSIVELY AT NEIMAN MARCUS Clean, refined lines juxtaposed with free-falling crystal. 22"Dia. x 23"T; 10' cord. Taupe faux-silk and glossy-silvertone shade. Includes iron 5"Dia. canopy and chain. Uses 3 100-watt bulbs. Assembly and professional installation required. Imported. Weight, approximately 18 lbs. Boxed weight, approximately 22 lbs. Handcrafted chandelier. Iron and optical glass. White synthetic silk drum shade. Cascading strands of encased faceted crystals. Uses 11 60-watt bulbs. Direct wire; professional installation required. 36"Dia. x 27"T with 10'L chain and 8.25"Dia. ceiling canopy. Imported. Weight, 38 lbs. Boxed weight, approximately 58 lbs.